Has your feline companion been acting unusual? Are you concerned that an illness or injury may be to blame? When people get sick or hurt, they go to the doctor, explain their symptoms and receive the appropriate care. With cats, it’s not always this straightforward. Because our animal family members can’t speak, they can’t tell us when something is bothering them. What’s more, cats are often able to hide the signs of illness for long periods of time. All the while, the condition is able to develop and worsen. In cases such as these, we rely on veterinary diagnostics to get the answers we need. These tools and technologies allow us to conduct an in-depth evaluation of your kitty’s health, both externally and internally. 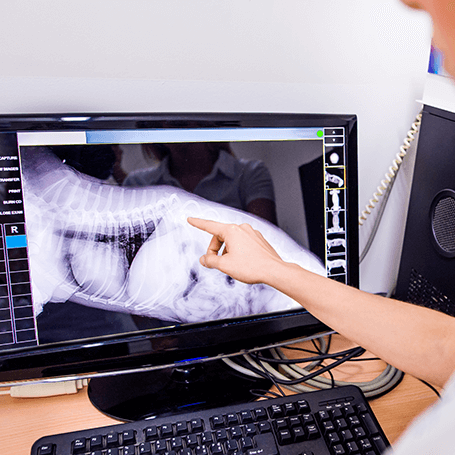 By gathering a complete picture of your pet’s condition, we’re better able to diagnose and treat health problems in a timely manner. Faster diagnosis of illness and injury can vastly improve the chances of a positive outcome for your companion. Our hospital features an on-site diagnostic laboratory, which makes it fast and efficient to run a wide variety of tests. In many cases, we can have results within just minutes. This means we can have a treatment plan in place before you and your furry friend even leave the exam room. The ability to run blood work, urinalysis and other tests in-house is especially beneficial for critical cases when time is of the essence. Laboratory work is also available for routine health screenings as part of your kitty’s wellness care. In some instances, a physical exam and lab work simply aren’t enough to effectively assess your pet’s condition. That’s why we also offer advanced imaging services. These tools, such as x-rays, allow us to look inside your companion’s body and learn precisely what’s ailing him or her. We can use imaging to evaluate the bones and internal organs, identifying injuries, diagnosing illness and determining its severity. Images can be analyzed by our doctors in real-time or shared electronically with specialists if necessary. If your four-legged family member has been acting a bit out of sorts lately, don’t take chances. Give us a call right away. We’ll get to the bottom of the problem and get your pet back on the path to good health again.